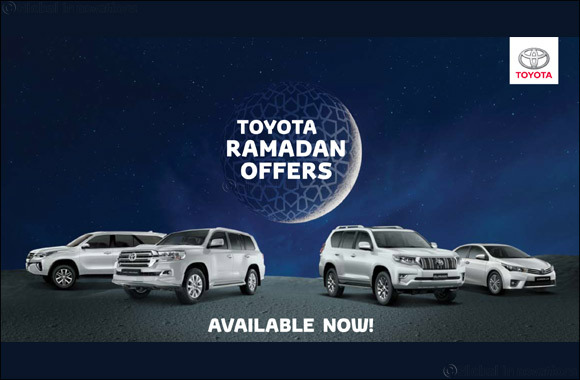 Dubai, United Arab Emirates, May 16th, 2018: Al-Futtaim Toyota announces new deals on its previously launched Ramadan campaign, giving customers a wide array of choices between offers on new cars, pre-owned vehicles and aftersales services. With savings over AED 40,000 on certain new models, the one-year free insurance, free registration and four years/80,000 Km Toyota care bundle is topped with instant valuable gifts for customers buying their cars during the holy month of Ramdan. More interestingly, the Toyota Ramadan promotion covers two special white and black Land Cruisers editions, which feature exclusively designed leather seats, front coloured grille, headlamps and a novel badge, offering the brand’s enthusiasts an exclusive entry to the premium Toyota world. Additionally, customers can save up to AED 10,000 in cash when buying a certified pre-owned Toyota in addition to three months deferred payments. More interestingly this year, Ramadan gives Toyota owners the opportunity to pamper their car with a Car Care Offer, that includes a special body polish, an anti-bacterial air conditioning clean, coupled with window tinting and a complementary valet service for only AED 399, offering Toyota loyal customers one of the most requested services available for a reduced rate. Saud Abbasi, Managing Director of Al-Futtaim Toyota, said: “This period of the year is very important for us, as our customers anticipate our Ramadan offers with much excitement, knowing that this is one of the best times to buy a Toyota. This year, we have something special to offer to everyone and our customers will be spoilt for choice”. All Toyota showrooms in Dubai* and the Abu Dhabi Airport Road will operate Saturday through Thursday, from 9.00 to 14.00 and 20.30 to 12.00 midnight and Friday from 20.30 to 23.30. All remaining showrooms across the country** will operate Saturday through Thursday from 9.00 to 14.00 and 20.30 to 12.00 midnight, and will close on Fridays.